The Greek Super League has been indefinitely suspended after PAOK Salonika’s president invaded the pitch with a gun during a match on Sunday. Savvidis, a Russian-Greek businessman, was restrained from reaching referee Georgios Kominis shortly before the full-time whistle was due, having grown angry with the decision to rule out a late goal for offside for his team in the eventual 0-0 draw. 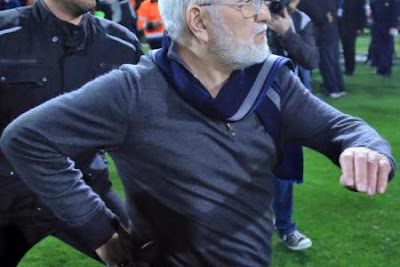 With confusion surrounding whether the goal had been awarded or not, PAOK president Ivan Savvidis walked onto the pitch accompanied by bodyguards wearing a handgun in a holster on his waist. The match was subsequently abandoned as Savvidis was escorted from the field. “We have decided to suspend the Championship indefinitely,” Greece’s Deputy Culture and Sports Minister Georgios Vassiliadis told National Greek broadcaster ERT following a meeting with the Prime Minister Alexis Tsipras. World governing body Fifa has threatened to suspend Greece from international competition and “expects” the national governing body to take “appropriate measures and rapidly”. It added in a statement: “Even though the recent incidents occurred in the context of a national competition, meaning that disciplinary measures fall under the jurisdiction of the competent judicial bodies of the Greek Football Federation, the Fifa monitoring committee is closely following this situation. The incident is the second match to be abandoned in the space of a month after PAOK’s game with Olympiakos Piraeus was abandoned before kick-off when head coach Oscar Garcia, formerly of Brighton and Watford, was struck on the head by a roll of paper thrown from the stands. PAOK was initially deducted three points for the abandonment, but had the sanction overturned on appeal.